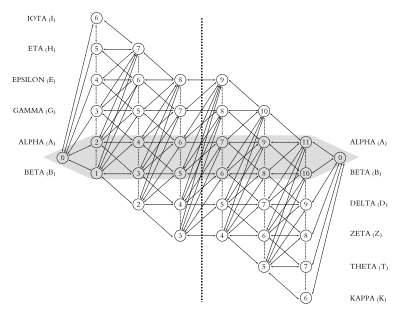 I am pleased to announce that my latest theoretical paper, “Of Modes and Manifolds: The Landscape of Expanded Heptatonic Modal Pitch Space” has been accepted for the 2015 West Coast Conference of Music Theory and Analysis (WCCMTA). For those unfamiliar with the organization, the WCCMTA is a chapter of the larger Society of Music Theory (SMT). The paper, in short, encapsulates some recent research I have been doing in the area of modal theory, the centerpiece of which is my heptatonic manifold, seen above. This year’s conference will be held at California State University-Fullerton this year, from February 27th to March 1st, in conjunction with the 14th Annual CSUF New Music Festival. If you’re interested in hearing about the manifold, and finding out more about this year’s conference, the site can be found here. More details on the schedule should be posted up there very soon. It should be a great event, covering the latest theoretical trends, and I’m quite excited to be a part of it.